It took me a few tries to get these right. The flavor was almost right, the texture was close, but I don’t like to settle for just “okay” in the muffin department. There can be greatness, so why stop at mediocrity? The trick was to add a little vanilla, and be just a bit generous with the oils … and then I had it. 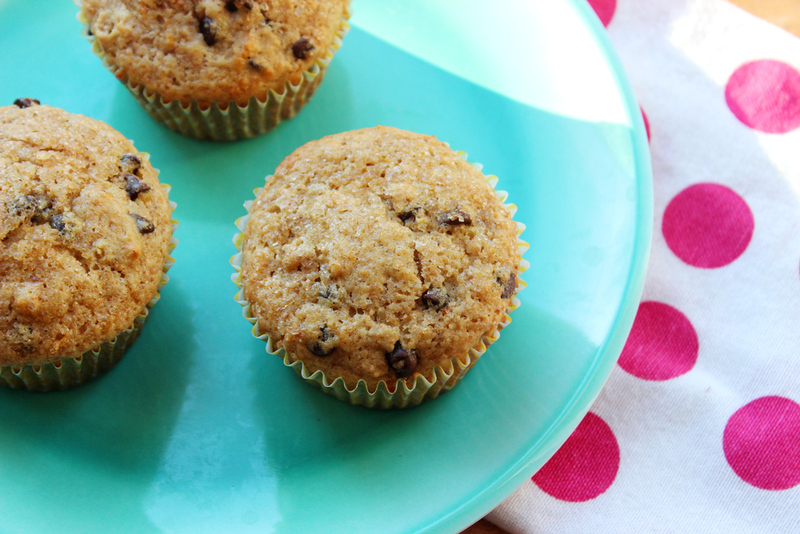 The orange gives them a little burst of freshness and lightness (with a nice kick from the blood orange olive oil), the mini chocolate chips make them feel more decadent than they are, and the vanilla smooths it all out. The other trick was to make them when there are lots of people around to ooh and aah and eat them. Having them sit on the counter is sad and wasteful, and they have a fairly short shelf life: after a few days, they get a little dry. If that happens, all is not lost: just pop them in the microwave for about 15 seconds. I made these once with blood oranges and once with regular, and both were delicious. Just be careful to keep an eye on these, and don’t let them sit in the oven too long! Your only enemy with these is dryness, and it’s conquerable, I promise. When it doubt, take ’em out. 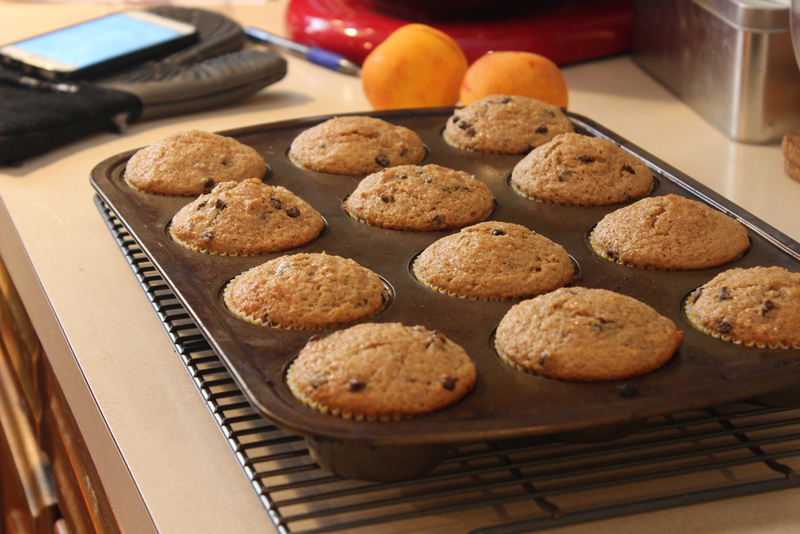 Heat oven to 425 degrees, and line a 12-cup muffin tin with baking cups or spray it with cooking spray. Zest and juice the oranges. In a large bowl, whisk together the flour, wheat germ, baking powder and salt. Add the mini chocolate chips and stir well. Make a well in the center. In a medium bowl, whisk together the eggs, sugar, milk, zest, juice, vanilla, and both oils until thoroughly blended. Pour the liquid mixture into the well in the flour mixture, and stir with a spatula just until incorporated. Batter will be a bit lumpy! Don’t fret. 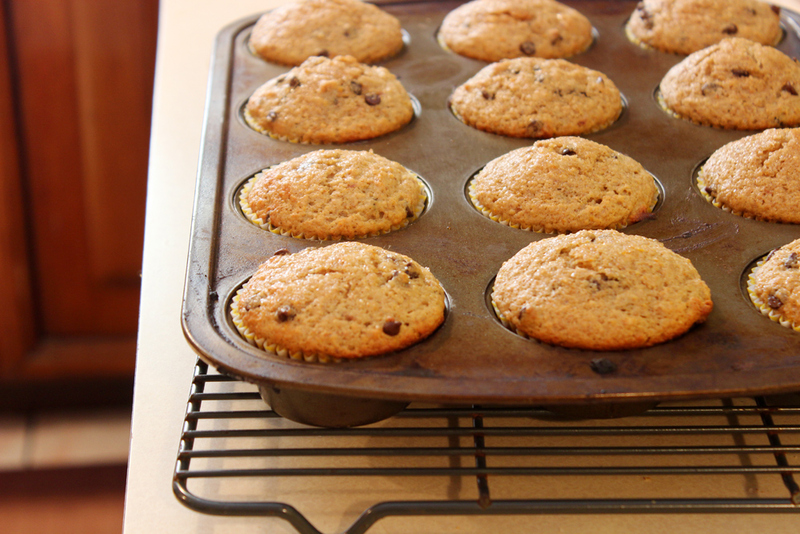 Scoop the batter into muffin tins, dividing as evenly as possible. Bake at 425 for 5 minutes, then reduce temperature to 400 and bake for another ten minutes or so. 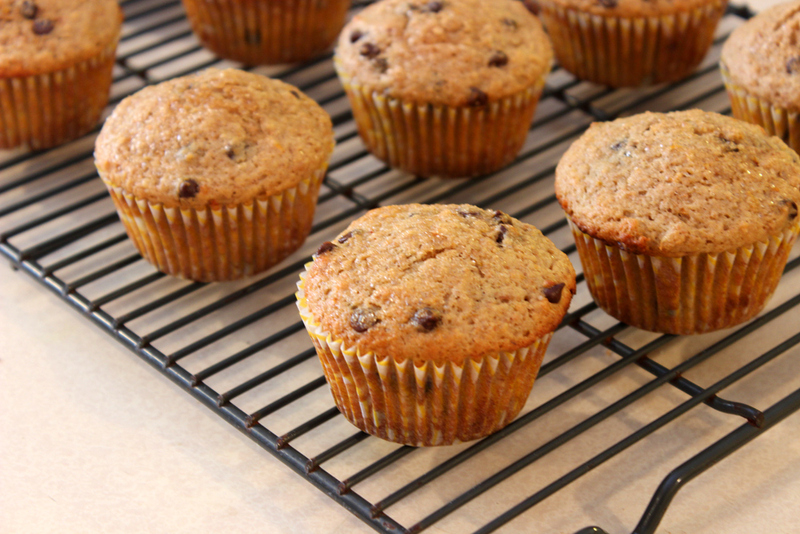 When a toothpick comes out clean, remove from the oven and give them another 5 minutes in the muffin tin. Remove to a wire rack to finish cooling.